Credit sometimes gets a bad rap in the world of business because it’s associated with debt. Even novice business owners know you want to keep your debt low and your revenue high. Limiting overhead and other discretionary expenditures is important for balancing your bottom line, but a credit card for your business may actually be of some help. Instead of thinking of a credit card as a way of spending money you don’t have and creating debt, you need to think of it as an important bookkeeping tool. In a small business with a solid creditline, you could run most of your expenses through the credit card and have an accurate accounting of costs at the end each month. For ease of bookkeeping, you should definitely have a credit card for your business to allow you to keep those expenses separate from personal charges. A business credit card account usually comes with some incentives to spend. Credit cards offer you various rewards for making purchases with the card. And since your business is spending that money anyway, you might as well use the card and get points to use toward travel, merchandise discounts or even cash back. Business credit cards also help you establish a credit rating for your business. If you ever want to apply for a grant or a loan, good credit will be important. Just like your personal credit rating, it shows you’re a good risk because you pay your bills on time. You never know what you may need in the future to expand your business, so it’s a good idea to establish business credit now, just in case. If the future of your business includes additional employees, a business credit card will help you track their spending on behalf of the company, as well. Issuing a company credit card to your employees lets you monitor their travel expenses, for example. It can also simplify your bookkeeping by allowing you to write one check for travel expenses each month to the credit card company instead of reimbursing each employee separately. 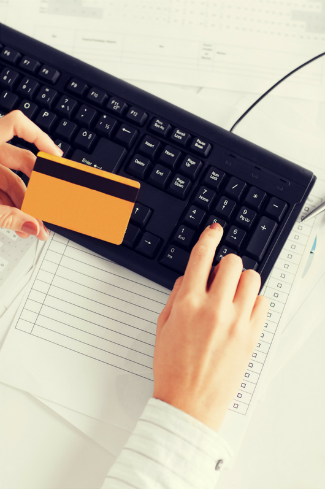 Using a business credit card can simplify your bookkeeping in other ways, as well. The monthly statement tracks purchases and returns, so you don’t have a bunch of voided checks in your account. A business credit card also offers some purchase protections. When you buy from a new supplier and the goods are never delivered, the credit card can recover your money more easily than if you had to go through a bank or collection agency. Review the rewards program to be sure it’s something you could take advantage of. Check the fee policy for hidden expenses. Review the interest rate policy on credit balances. Determine which type of card is accepted by the vendors you deal with. Ask if your business qualifies for a credit card without your personal guarantee. If you’d like expert advice on business credit cards, outsourced bookkeeping or business coaching and consulting, contact SLC Bookkeeping today and tell us how we can help you.